I’m not a major coffee drinker, in fact coke and latte macchiato are the only caffeinated drinks I ever have, but when I was asked, if I would like to review the Tassimo T40 coffee maker, I instantly thought of the range of hot drinks that would come with it and agreed. Last week, we received the Tassimo T40 in black as well as a selection of coffee and hot chocolate pods. My parents have one of the older Tassimo models and Ben has always wanted a Tassimo himself, so as soon as the parcel arrived, we unpacked it and set up the latest addition to our gadget collection. As we already knew the concept behind the Tassimo coffee maker, we didn’t have to waste time reading the instructions and started making our first brew within minutes of receiving the Tassimo T40. If you have never used a similar machine before, it might be reassuring to give the manual a quick read. It really won’t take long as the Tassimo T40 is really easy to set up and operate. All you have to do is fill the tank with water, insert a pod, close the pod compartment and press a button that regulates everything. It really couldn’t be easier. Milk-based drinks such as cappuccino, latte macchiato or some hot chocolates come with an additional milk pod, which dispenses frothy milk and makes your drink extra creamy – yummy! You can even make cups of tea with your Tassimo, although I’m not convinced that this option is really great value for money. It is much quicker than putting the kettle on and popping a tea bag in a cup, but a pack of tea pods costs around £3.79 and I would only get 16 cups of tea out of it. If I bought a pack of tea bags and made tea the conventional way, I’d pay a little less and get at least three times the amount of tea. So, if you are on a budget the tea pods might not be the best option for you. Convenient however, they are! All in all, the Tassimo T40 is a fab little kitchen gadget. It’s not as big as its predecessors so doesn’t take up too much space in your kitchen. It’s easy to clean and most of all easy to use and it allows you to drink your favourite hot drinks at home. Check out my friend’s blog The Crazy Kitchen. Helen created The Ultimate Caramel Macchiato and you can recreate it at home using your Tassimo. It looks so tasty! I'm a sucker for coffee machines and seem to have a habitual habit of choosing the wrong one, i was looking into the nespresso machine as it seems to offer a wide range range of drinks you can have with it. This one have that same flexibility? 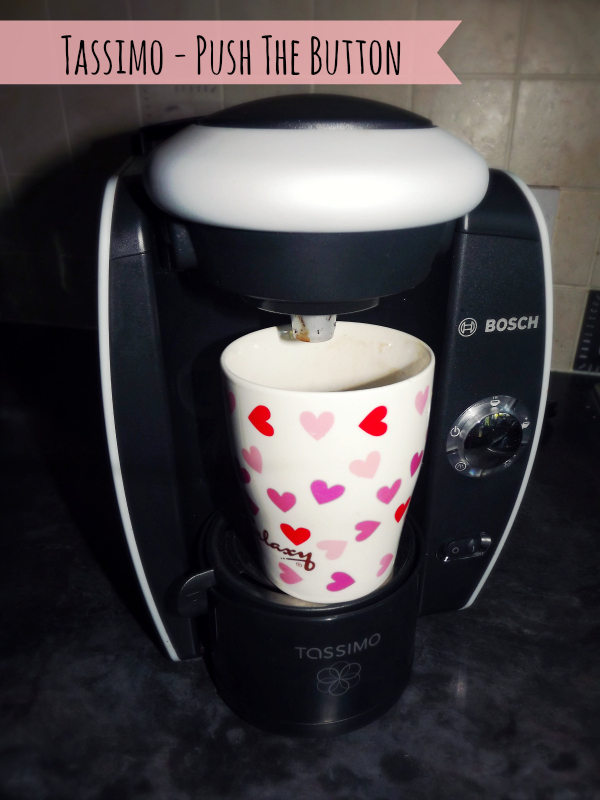 I am loving my Tassimo, it's so easy & quick – my espresso machine is now redundant! Thanks for the link – I expect you to try out my recipe! I'm currently searching for a birthday pressent for my mom. This could be perfect for her, thanks for the tip. My dad is looking to buy a new coffee machine at the office. Do you think this one will carry large tasks (100 coffees per day)? As much as I love the Tassimo T40, I think your dad would be better of with a conventional coffee maker as he would be able to make more cups at the same time and it would be more cost effective too.